Only your party in the rink- not public allowed. Your guests will have the use of the whole facility. Parties on these times will share the rink with other parties plus the general public. over 12 skaters $10 for each additional skater. Skates are included, roller blades are $2 extra. We require a $40 reservation deposit on the date of booking. we can accept Visa or Mastercard for reservations only. Balance due at the end of the party. Cash only please. Deposits are Non refundable but we can re schedule your party so you wont loose your deposit. We have a brand new Floor !!!!!!! Come test it out! Girls and Boy Scouts reunions. Middletown Roller Skating Rink opened its doors in 1948 as Holiday Skating Rink. In 2002 Maria Paquette ( A Physical Education Teacher with a Masters Degree in Recreation) became the new Owner. 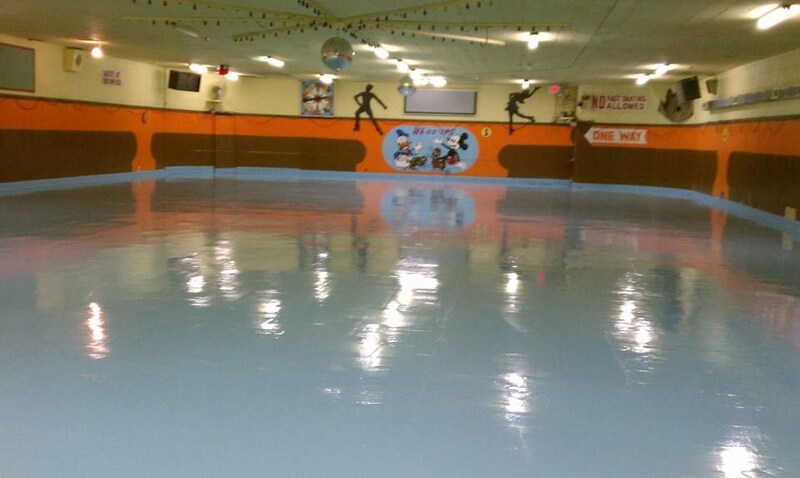 Middletown Roller Skating Rink is an indoor rink and open year round. Lace'em up and come join the others. Get on the floor and get ready for a great experience. We offer 2 different types of birthday parties. Open Skate times and Private times. For both types of parties we only charge for skaters , guest that don't skate are free. You can decorate and arrange the tables the way you prefer. You can decorate the table the way you like. 1: Chose the date you will like to have your party. 2: Call Us @ 860-704-0064 to make sure the date you want is available. 3: reserve your date with $40 via credit card by phone or in person, or in cash.